Note: This whiskey was purchased by us for the review. At no point were we given a sample or bottle by Buffalo Trace in order to create this review (although we wouldn’t have said no). No matter what, our opinions are always our own, honest, and hopefully helpful to you. 1. Really, is it worth it? 2. Does it taste as good as I think it does? Let’s take a step back though. I, for one, am a huge fan of Colonel E.H. Taylor and all of the releases that Buffalo Trace has put out in this line since they first released it in 2011. You may have been lucky enough to try the Small Batch, Single Barrel, Barrel Proof, and the Straight Rye, but you may have found the Tornado, Sour Mash, Seasoned Wood, and Cured Oak more elusive. The Four Grain release is the next in the line of these fine bourbons that, not only look amazing sitting on your shelf, but are also some of my favorite bourbons out there if you’re able to find them. The packaging really goes above and beyond. Each E.H. Taylor is contained inside a tube with similar packaging to the bottle. I don’t know what it is about bourbon that comes in a tube, but it just makes you feel fancy. As we all know, a lot of bourbon is all about marketing, so my hat is tipped to Buffalo Trace with this one. They really have hit a home run with these. This is the type of bottle that you feel proud to display on your top shelf. 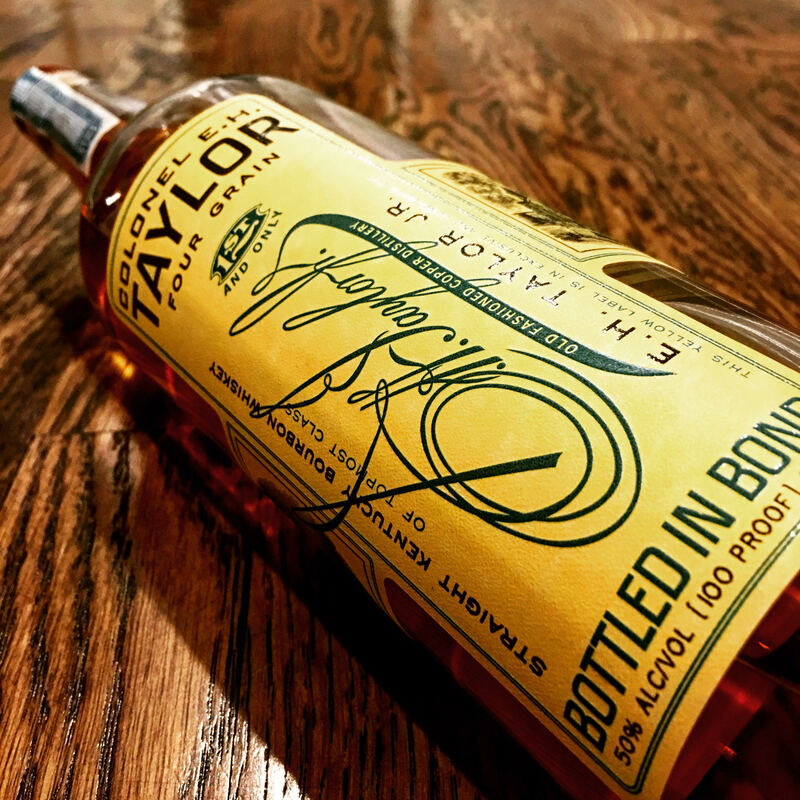 Although Four Grain is non-age stated, Buffalo Trace has released a statement in which it conveyed that this release was distilled in 2005, aged for 12 years, was put into barrels at 104 proof, and the resulting bourbon was a bottled-in-bond 100 proof limited edition release. The four grains (corn, wheat, rye, and barley) are a throwback to the four grains that Col. Taylor would have had access to when he was running the distillery in the late 1800s. As I previously stated, this bottle was for sharing. I know that there’s a lot of people out there that are just searching everywhere for a glass of this juice. I’m a firm believe that there’s no better way to share bourbon than with friends, In the spirit of that statement, I shared the first pours of this bottle with my friends Will and the Greeze from “The Podcask“. I should mention that I would have shared this with Zeke too, but he was on a family vacation. Make sure you check them out to hear the recording of our experience, but give them few days to edit first. Four Grain glistens when you pour it into the glass. There is a light amber hue that makes you think that you have found the pot of gold at the end of the rainbow. As it sits in the glass, you can’t help but notice the legs. I’m always a firm believe that a bourbon’s presence or lack of legs can really help to determine the quality. This bourbon is thick and leaves a presence to let you know it’s there. I almost think of you go on aroma alone, you may overlook many aspects of this bourbon. The aroma is sweet and floral with hints of oak. You wouldn’t guess the complexity of what you are about to try based only on the nose. Given the anticipation, you are expecting more the nose is simple, sweet, and pleasant. Immediately you are hit with the spices of the rye as Four Grain numbs your lips and the tip of your tongue. It’s a sweet spice though. There are hints of vanilla, caramel, berries/fruit, and some smoky oak. Wow… Okay, this is officially winning me over. As you get the initial sweet and spicy flavor, the finish just knocks you off your feet with a flavor bomb. It’s one of those stealthy finishes that makes you think everything has gone away and then bam, you get knocked off your feet with a sweet heat in your chest and you get that “Kentucky Hug” that lets you know everything is going to be okay. Sweet oak and rye is the best way to describe it. I believe you have to evaluate this with both a retail and secondary lens as it’s a limited release. If you are able to find this retail, don’t hesitate and Buy It. If you’re looking at secondary, the price can be extremely high for a limited release. You may want to just Sip It as you might not have $500-$600 in disposable income to enjoy this bourbon, but you may have $30 to enjoy a pour at a nice bar. I know that I wouldn’t be able to justify a secondary purchase at those prices. I have to say that this one really lived up to the hype for me (and I had hyped it up a lot). I was not disappointed, even though the nose was a little deceiving. I know you’ll be fighting with a lot of people for it, but I would make sure you try this one somehow. I was the first to taste a new bottle of this at my favorite watering hole in Santa Rosa, CA, and it’s now what of my top 3 favorite bourbons.